Short Info: It is expected that the application for SSC MTS Recruitment 2018 will start from November month. And, applications will be available until the first week of December 2018. So, interested candidates will able to apply for this recruitment in November 2018. Candidates are suggested that they should prepare for the examination from now. Because, as per previous years received applications data, there will be huge competition among the candidates. A great number of candidates will apply for the same. If candidates will start preparation for the written examination from now, then they will be able to crack the merit list of the written examination. And for that, they should have knowledge regarding SSC MTS Syllabus 2018 and exam pattern. As we discussed that SSC MTS Syllabus 2018 and exam pattern is how much important for interested candidates. Let me explain you syllabus of SSC MTS. There will four sections. The first one will General English. The second will General Awareness. The third will be Numerical Ability. And, the last one will be Reasoning section. You can check the syllabus and exam pattern from the official website and can get an idea of the exam schedule. 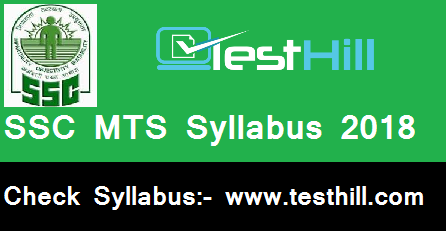 We have also provided the SSC MTS Syllabus 2018 and exam pattern details on this web page. They are able to check it from here also.